Another week starts, and therefore so does another Fabricworm Giveaway! This week we're giving away a fat quarter bundle of Meadow's Picnic in the Hills by Leah Duncan! And check out the Meadow Collection here. This giveaway ends on Sunday 3/2 @ midnight PST. The winner will be contacted shortly after by email. The winner will be chosen by random.org through Rafflecopter. the giveaway says it hasn't started yet. A quilt of course! The fabrics are so bright and summery. Oh, this must be summer clothing for my daughter! Tunic, and maybe a bag? Beautiful spring colors. How about a patchwork layered skirt? I'd make a quilt for my daughter. A travel blanket for my sweey new baby. A baby quilt, of course! A quilt to dress up my extra bedroom and keep my granddaughter warm when she visits. I really want to try making dresses for my daughter! These bright colors would make a great spring/summer quilt! Very cute collection, and a great giveaway! A sunny quilt to brighten up my bedroom! I would make a purse, love the fabric! Thanks for the chance! Beautiful collection! I'd make a lap quilt for my mother. I hope I win! I would finally be able to start a nice stash for crafts. I would make coin purses + line zip pouches. Oh my! There are so many things I can do with this fabric. Fun things for my granddaughter. My creative side is running wild! :-) Thanks so much for the chance to win. I would make a few cute things for my 3 year old daughter! She loves fabric as much as I do! Lovely bright colours!! !My cousin gave birth to a baby girl recently and I want to make some gifts for her little one! a quilt for my baby girl to be born in May. I'd make so cute clothes for my daughter...or maybe try my hand at a quilt. Still haven't gotten brave enough. I would make a spring bag! Thanks for this giveaway ! I would use the fabrics to make something for summer. Yes, summer ! Like a beach bag with the towel and pillow sewed in. And a purse, for the pub after the beach ;) The colors are so nice ! I would make quilted pillow covers for my bed. They'd be so pretty! I don't know what I would do with them, but they are all lovely! Thanks for the chance to win! Love the softness in the coloring. I think this would make a lovely tumbling block quilt for a baby. I would make beautiful things! Probably a dress for my daughter, or some throw pillows, or a quilt...I can't decide! I think I would make placemats or table topper. I would make something cute for my new granddaughter. I love your giveaways! Have never won but I keep hoping! This would make a lovely springtime quilt! Hello, I'd make a new Quilt for sure! Beautiful fabrics! Thanks so much for sharing! A dress for my baby girl! I'm playing but how can I find the id url on Facebook ? I would make some pretty cushion covers! Something to hurry spring along - love these colors! Yeah! a giveaway and I could make a spring outfit? 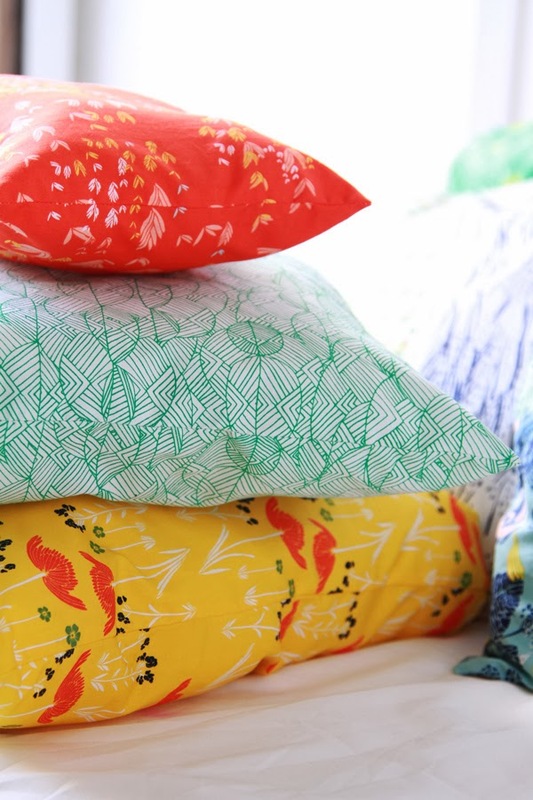 Such Lovely Lovely fabrics! Would Love to win them and make a baby quilt! I would make a wallet! I would make an apron. Would love this to make more Scarf Bibs for my baby! I would make two of those Oliver and Sun heads. And a open wide zippered pouch, maybe a patchwork-Version. I think these will mix and match nicely with some other Art Gallery fabric I have. Ooh! Either a bag or a quilt for ME! So lovely! These are so pretty! I can think of several things I'd like to make from them! Thanks for the opportunity! a skirt!!! Or maybe a quilt. I'd love to make my brand new niece a matching apron or lap quilt with her doll! I'd make my niece an apron or quilt and one for her doll to match! I want to make a curtain for my living room! I've been looking for a good fat quarter set to make a herringbone quilt I found on pinterest. This would be perfect! I would make cute little girl's dresses and bloomers! I would make an apron for a friend! A quilt of course!!! =) Thank you for the opportunity! I think I would love to have some bags made out of these. Love the colors. I'd incorporate the FQs into quilts. maybe all the same quilt but maybe not. Thanks for the chance to win, gorgeous!!! I can think of many things to make, hats for summer,kids clothes,bows,rag rugs,purses and quilts. Love the prints and colors. I actually think pillowcases for the bedroom, I dig this line so much! Summer clothes for my step daughter! I'd use this for the quilt I promised my daughter two years ago! Super cute fabric! I would make a sweet little apron! I love these patterns. I don't know if I would've chosen them myself but I love the look! I'd make a quilt and some cushions! I'd make badge reels and paci leashes. I'd use them to make a quilt! I love this collection! Thanks for the giveaway! I'd make some bright scrappy blocks! The fabrics would make a beautiful quilt. Thanks for the chance to win this great giveaway. I've added your giveaway to the Giveaway Round Up at wowilikethat.com. Over 50 giveaways already this week. Thanks for adding to the fun. Those colors would be great in my granddaughters room, but I love them! I might have to be selfish and make a quilt for me! I would make a wall hanging and pillows with this fabulous fabric! A patchwork pillow would be on my list. I'd love to make a bag! Oh these would be perfect for a baby quilt! The Picnic in the Hills collection is beautiful and would make a cheery quilt to celebrate the end of winter and start of spring and warm weather! Thanks for the chance to win. I love these prints. Beautiful, spring colors and designs! I would make some spring dresses for my two little girls! Omg they would be a beautiful quilt! Very beautiful fabric for my first quilt. I would make a small quilt. This would make some fun bags or bodies for dolls. Oh! Yummy fabric. Goes for a summer quilt. That's what it reminds me of. Thanks for the giveaway. Baby quilt for my spring baby. I would make something for spring/summer, a bag or something for one of my granddaughters. Love the colors! Perfect for our new bedroom done in orange and turquoise. I would make a skirt for my daughter - lovely fabrics! This bundle looks perfect for a summer dress with ruffles for my granddaughter. i would make amy butler's weekender bag or maybe a spring-themed wall hanging! Oh, I would definitely quilt these fabrics up!!! So pretty! These would go in to a table runner for my office, so that is what I would make out of them! I think I would make a bag to take camping. Love the colors, looks like a new spring bag in my future. Thanks for the giveaway. I would make a little dress for my grandbaby, Nellie. I would love to make a quilt for my god-sons' parents! I'd use the fabric to make a few small doll quilts and dolls as Easter gifts. Thanks for the chance! I would like to get my mother-in-law the quilter to help me make a quilted pillow or table runner. The colours look so nice for spring. These fat quarters will make a lovely baby quilt. It would be perfect for a summer quilt. I would make a bag! Thanks for the chance to win! I would make a bag. Thanks for the chance to win! I would make a quilt or zipper pouches. This would make a gorgeous spring quilt! I would make a beautiful summer quilt for my porch. I would make an awesome messenger bag!! or perhaps make my very first QUILT! Maybe a cute tote bag. This would make a lovely quilt. A fresh quilt for Spring and Summer! I think I would have to use it in a beautiful quilt fro my 2nd daughter. I am currently making a hexagon quilt for her and these colours would just be magic in the quilt. Skirts for my granddaughters or a tote. I'm sure some would go for bags for my Etsy shop, but it is all so pretty I would have to keep some for myself. I love the look of those pillows! Love this line! Would make a lovely quilt. Beautiful and perfect for a quilt!!! Thanks for the chance to dream a little!! A patchwork dress for my daughter. I'd make a quilted pillow. I make a summery lap quit for lounging on the porch. Thanks for this lovely giveaway! Lovely! I'd make a quilt for my niece. I would make a quilt for my niece who arrives in June! Curtains, table cloth or pillows! Some into stash; some into a quilt I am making for a son as a wedding gift. Love this pattern. I would definitely make a quilt. 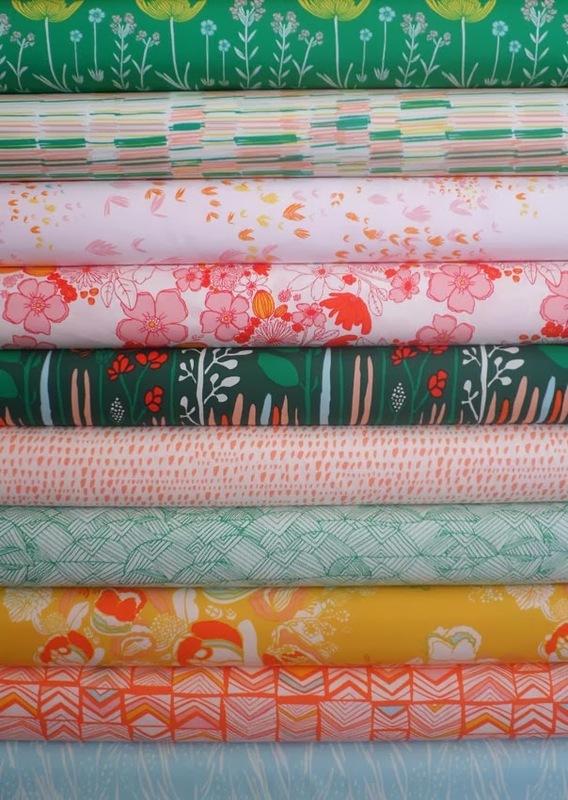 I would make a lightweight quilt, those fabrics just scream "springtime". I love Leah Duncan! I'd make a quilt. A quilt for my lovely 6 year old daughter. Leah designs the best collections! I would make a quilt for mysel! Gorgeous colours. I'd definitely make a quilt. Perfect for the deck this summer. I'd make a quilt to celebrate spring. It can't get here fast enough this year! I'd make a quilt for sure. Beautiful fabric. With 10 fq has to be a Springtime quiltfor the guest bed. I would love to make a couple toss pillows with this fabric. These would make a beautiful pillow! Great fabrics! Dresses for granddaughters...such a fun thought! Definitely a quilt. And probably a dress for my daughter. I see lots of dolly dresses! Love them, I would make something for my kitchen! I'd make some pillow covers and burp cloths. 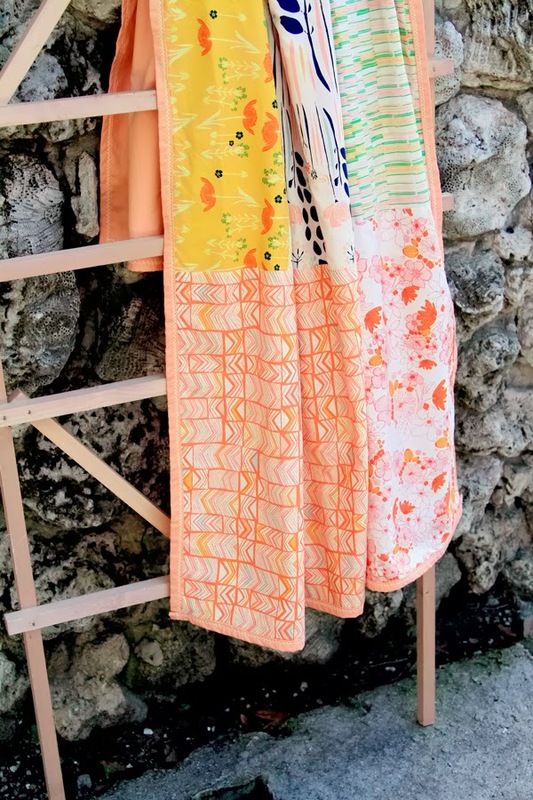 I love the lightness of these prints, they would turn into little girl skirts in this house!! I would make some patchwork project bags with those gorgeous fat quarters!